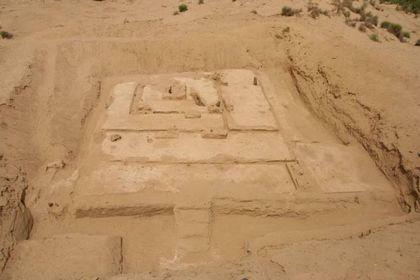 From May to June 2010, the Xinjiang Archaeological Team, IA, CASS, excavated successively the No. 3 Buddhist temple-site at Topulukdong in Damago of Cele County, Xinjiang. An area of about 800 sq meters has been uncovered and the whole Buddhist temple came into the light. The preliminary analysis revealed that the No. 3 Buddhist temple-site was the first discovery of buildings complex for monks’ living and studying within the Taklimakan areas. The important finds included the broad yard, living rooms and lotus-shaped stoves. Like No. 1 and No. 2 sites, this site belonged to the same large Buddhist temple, whose plane looks like today’s Uygur architecture, thus it provided a new material for the research on the early Buddhist architectures in Taklimakan area and its historical origin-relationships with the local modern architecture. 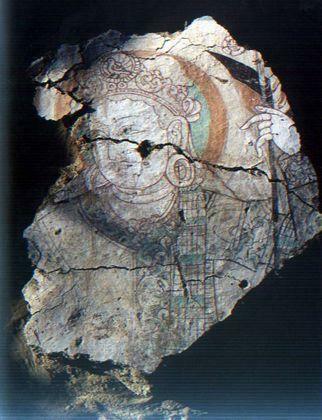 The excavation yielded about 60 pieces of frescos with an area of about 50 sq meters. The contents included life-sized laypersons, ancient Khotanese inscriptions. 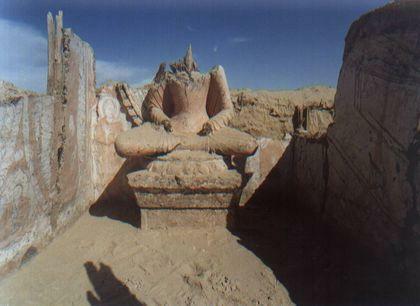 The Buddhism themes were quite rare and the majority represented the secular affairs, which was hitherto the first discovery among ancient temples in Xinjiang. Most painted figures were dressed in Tang-Chinese costume, reflecting the direct cultural connection between Chinese Central Plains and the Taklimakan area. All wall paintings displayed a style and skill of the Khotan Painting School.